Militants continued shelling Ukrainian Armed Forces’ positions near the contact line in the Luhansk sector of the ATO area using mortar launchers and light weapons. “Hostile mortar crews opened disturbing fire at Popasna and Novozvanivka. Russia-backed militants used small arms and grenade launchers in Stanytsia Luhanska,” said the spokesman of the Ministry of Defense of Ukraine on ATO related issues Colonel Oleksandr Motuzyanyk during a press briefing at Ukraine Crisis Media Center. The situation was the most difficult in Krymske. Militants opened mortar fire three times from three various directions which lasted over three hours in total. Russian proxies launched more than 160 mortar shells during one attack. In total, militants conducted 14 attacks in the Luhansk sector yesterday, and five of them involved the use of mortar launchers. One Ukrainian serviceman was killed in combat yesterday, and eight more sustained wounds and injuries. In the Donetsk sector Russia-backed militant groups continued shelling the areas at the Svitlodarsk bulge, Horlivka perimeter, Avdiivka and the Donetsk airport from mortar launchers. “The enemy used mortars to open disturbing fire many times, launching about 10 shells per one attack. Hostile mortar crews opened low intensity fire several times a day, launching about 40 mortar shells each time,” said the spokesman. Militants were shelling Svitlodarsk and Novhorodske for over an hour in the afternoon and launched almost 30 and 40 shells there correspondingly. According to Col. Motuzyanyk, an attack started near Avdiivka about 5 p.m. It came from eastern and southeastern directions and lasted over four hours. 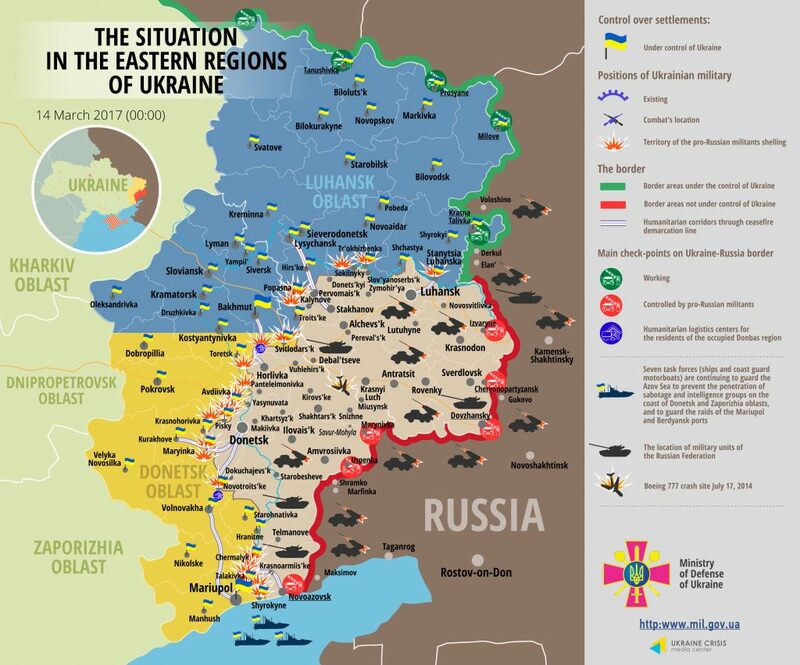 Militants used 122-mm artillery, tanks and light weapons of various types. “A volunteer was wounded in a hostile attack from grenade launchers at a checkpoint in the vicinity of Avdiivka’s industrial area around 5.30 p.m. yesterday. The injured woman was taken to a mobile hospital in Pokrovsk were she was provided medical assistance. Her condition is satisfactory now,” said Col. Motuzyanyk. Militants were conducting medium intensity mortar attacks in Opytne and Verkhniotoretske. Moreover, insurgents were shooting from 152-mm artillery at Luhanske late at night. In total, 49 militants’ attacks took place in the Donetsk sector yesterday, and 28 of them involved the use of heavy armor. Power engineers jointly with the military and emergency services repaired power supply in Avdiivka during the day during several hours of comparative lull in the fighting. “Renewal of power supply in the town gave the opportunity of full-fledged operation of Donetsk filtering station, providing water supply to the town and the adjacent inhabited localities,” informed Col. Motuzyanyk. Militants are actively performing provocations using small arms in the Mariupol sector. They conducted three attacks from heavy weapons during the day. Militants opened fire at Pavlopil two times from 122-mm artillery and launched over 30 shells here. Moreover, Russian proxies shelled Marinka from mortar launchers after 9 p.m. “Hostile sniping groups were active near Shyrokyne. Absolute majority of ceasefire violations traditionally occurred in Pavlopil – Shyrokyne frontline area,” said Col. Motuzyanyk. In total, militants conducted 34 attacks in the Mariupol sector in the last 24 hours. Report on the military developments as of March 13 is available here. Interactive data on the shelling: chronology shelling chart and the interactive map.